See our complete list of places to canoe in New York. Enjoy private and guided canoe trips by searching through our guide to canoeing in New York. 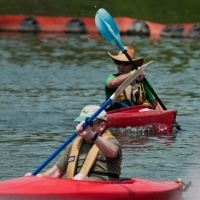 Find New York canoeing in the five boroughs and other parts of NY. Canoeing, Kayaking, Sailing, and more! An all volunteer and non-profit membership organization, the Sebago Canoe Club consists of kayakers, canoeists, sailors, rowers, and flatwater racers in the New York area. As a member you receive use of the clubhouse and club boats, boat storage, and a cabin; as well as instructional programs in sea kayaking, sailing, and flatwater racing. Catering to small boat enthusiasts in the NY area, the club's history spans over 75 years, attracting members of all ages and races. 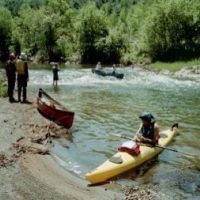 Participate in all types of fun activities and events, like bi-weekly kayak trips and canoeing day trips. If you have a passion for canoeing in NY or any other type of boating, join the Sebago Canoe Club today! Canoeing and Canoe Tours in NY! A wonderful locale for canoeing in New York, the Bronx River is one of the state's little-known marvels. The 23-mile river is also ideal for fishing, strolling, biking, nature study, and different types of boating. All in all, the river serves as a peaceful retreat from the hustle and bustle of urban life. 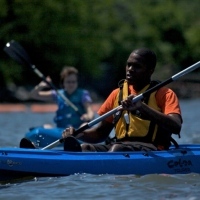 The Bronx River Alliance offers a recreation program in which people of the community can engage in all types of canoeing, kayaking, and bicycling activities. During paddling season, the program offers a full calendar of public canoe tours. If you'd like, you can even organize a private tour! 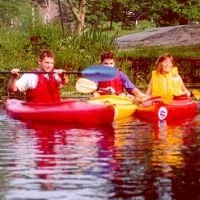 Nissequogue River Canoe & Kayak Rentals, Inc.
Great Canoe Rentals in NY! With a courteous and friendly staff, Nissequogue River Canoe & Kayak Rentals is dedicated to ensuring that you have a most pleasurable time on the waters. The company will outfit you with all the necessary equipment and instruction, so that your trip will be as stress-free as possible. Enjoy a fun-filled mini-vacation in NY on one of Long Island's most scenic shores! At the end of your trip, the staff will load all boats onto transport vehicles and you will be taken back to your car via a private bus. Over time, the company has earned many repeat customers and you'll see exactly why! Guided kayak tours are available. Be sure to pack a lunch prior to your trip. Competitive and Recreational Canoeing in NY! Established in 1902, the Inwood Canoe Club is a non-profit organization that promotes canoeing and kayaking on NY's Hudson and Harlem Rivers. Consisted of members who are enthusiastic about paddling, Inwood is the oldest canoe and kayak club in Manhattan. The club educates, trains, and develops paddlers; preparing them for recreational and competitive canoe and kayak activities. Between 1936 and 1986, 5 of the members competed in the Olympics. Over the last decade the club served approximately 3,600 paddlers, mainly from the Washington Heights and Inwood areas. Inwood continuously participates in efforts to improve and maintain a portion of the Hudson River shoreline. Fun and Safe NY Canoeing! 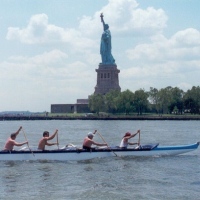 As Manhattan Island's first outrigger canoe club; New York Outrigger is a volunteer-driven, non-profit educational organization committed to the sport of outrigger canoeing. Established in 1996, the club has helped thousands of New Yorkers become safer and more confident on the waters. The club participates in several East Coast outrigger canoe races; as well as community events like beach clean-ups, youth programs, and public introductory clinics. Whether you're a novice or an experienced paddler, New York Outrigger seeks members of all levels and abilities. One of the Great Places to Canoe in NY! If you're searching for places to canoe in New York, Willowbrook Park serves as a beautiful backdrop for canoe trips with friends or family. Experience the rhythm of the waves, the sun on your face, and the excitement of slicing through water. 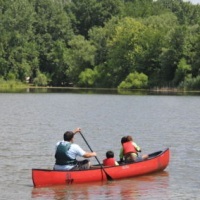 At certain points of the year the urban park rangers offer free, basic canoe lessons to children and adults. The park is home to hundreds of acres of wilderness and active recreation. In addition to canoeing you can enjoy hiking, tennis, bird watching, archery, baseball, dog runs, and picnicking. You can even take your children to the park's famous carousel! Canoe in one of NY's Largest Parks! 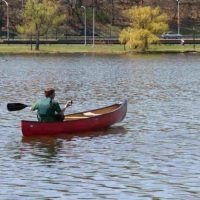 A great place to go canoeing in NY, Flushing Meadows Corona Park continues to delight visitors from all over the globe. As the largest park in Queens, you'll be given plenty of space to go canoeing and engage in other fun activities like baseball, soccer, tennis, and cricket. The park also includes a recreational complex, a zoo, an art museum, a botanical garden, a science museum, and a baseball stadium. In order to canoe in the park, you must have a proper permit. Your One-Stop Shop for NY Canoeing! As one of the best canoe and kayak shops in NY; Adirondack Paddle 'N Pole offers a wide array of canoes and kayaks for sale and rent. With each canoe or kayak purchase you get 20% off paddles, life jackets, cockpit covers, sprayskirts, and accessories. Adirondack hosts a series of canoeing and kayaking lessons, as well as evening tours. View the website to keep updated on upcoming events. To fulfill even more of your outdoor adventure needs; you'll also find cross country skis, boots, bindings, poles, and kicker skins in stock. Rent or Buy Canoes, Kayaks, or Paddleboards! At the Peconic Paddler you'll find a large inventory of canoes, kayaks, and stand-up paddleboards. 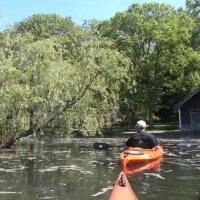 Rent a canoe and enjoy a relaxing 8-mile, 4-hour canoe trip along the Peconic River! Or you can rent a canoe and go upstream for one or two hours. Take a look around Peconic's specialty showroom, and browse through over 500 new and used kayaks and canoes for sale. Experienced paddlers are on staff to help you select the perfect vessel to fit your needs. Check the website regularly to keep updated on canoe trip schedules and upcoming paddling events. If you need any additional information, please call 631-727-9895 or 631-834-2525, or send an e-mail to info@peconicpaddler.com. Enjoy NY Canoeing on the Beautiful Mohawk River! At the Boat House in New York; you'll find quality canoes made of such materials as wood, aluminum, fiberglass, Kevlar, polyethelene, and ABS Royalex. 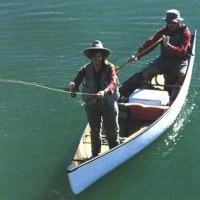 Whether you're planning on fishing, camping, racing, or simply looking to enjoy a quiet day on the water; the staff will help you find the appropriate canoe for your next outdoor adventure. The company's product line varies in design, materials, size, weight, seating capacity, and price. Buy canoes from such brands as Mad River, We-no-nah, Grumman, Old Town, and Radisson. Canoe rentals are available from May through October. The store is conveniently located on the Mohawk River, allowing you to try out your canoe right after you make your purchase. 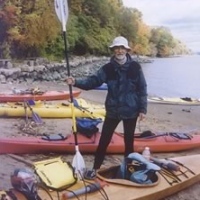 The Boat House also sells a wide variety of kayaks, rowing shells, paddles, life jackets, roof racks, books, videos, and other related materials.